Agricultural Research Center (Khun Wang) is the research center for the farmers in the surrounding Luang Chiang Mai Inthanon mountain ranges. Even Khun Wang is away from main roads deep into the 16 km that made the trip to come here. Vehicle needed Otherwise, travelers would have to hire the vehicle from the entrance of Doi Inthanon to arrive here, but is not obstacle for tourists who want to relax and nature study. Or agricultural tourism at this place. This place will welcome visitors with numerous species of temperate united bloom finger. Full results from the tasting is cool in the summer. They are birds of the mountains of Doi Inthanon species studied. As well as overlooks the lush, landscaped surroundings with colorful seasonal change is not surrounded by. Point of interest within the area of 450 acres of agricultural research centers ( Khun Wang ) with various plots and fruit trees in winter. If you go to Khun wang in season fruit . Whether pear , plum, peach, strawberry, Mackinac Tarifa or berries. Travellers can taste of the time. If you visit during especially in the period from mid-January - February. 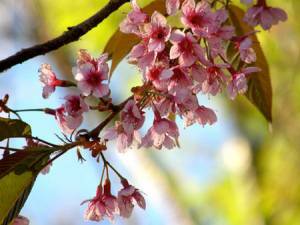 The flower queen tiger Sakura blooming pink to bright or early May. Drive to Doi Khun Wang became pink all the mountain. Visitors can walk within the agricultural study plots. The official visit to the paths. Vehicle used for travel within the center. Should be a four wheel drive pickup trucks or cars and bikes by points of interest include conversion of temperate fruit trees shed bark tea to coffee . And test plots with a macadamia varieties . Which are native to Australia Tourists can try weaving store And taste the fresh meat, which has a sweet taste to it. Salt , or to taste traditional roasted center has taste. And also the experimental results of making the oil too. Accommodation and facilities Royal Agricultural Research Centre is open daily between the hours of 8:00 to 16:00 pm, there were about 4 of hospice homes, each accommodate from 4-8 people tent with 2 points. Pasture area office building Greet and the ravine Both the tourists and about 100 people are serving in the price. Get free taste arabica coffee throughout the day. Should be contacted in advance of the call . 0 5311 4133 , 0 5311 4136. Doi Khun Wang Royal Agricultural Research Centre travel . Located in Moo 10, Mae Win , Mae Wang District, Chiang Mai. By car, visitors can opt for the second route, the first route of Chiang Mai. Sanpathong district Route No. 1013 to Amphoe Mae Wang. A place to Mae Will turn left , turn left. Then it traverses the path up the mountain for about 40 kilometers towards the end of this path is a road about 5 kilometers Din rainy require four wheel drive. The total distance of this route, 86 kilometers and takes about 1.5 hours from the start. From Chiang Mai to Chom Thong district before. Turn right on Highway 1009 to Doi Inthanon. Until kilometer 31, turn right on an asphalt road for about 17 kilometers to the Doi Khun Wang Royal Agricultural Research Center, a total distance of 115 kilometers and takes about 2 hours. By bus Mai Mai came to the door, then to the minibus from Mai - Mae . Down at the junction to Doi Inthanon at kilometer 31 of the charter bus to be fed to a paste. Or charter bus from the Chom Thong. Visitors can choose to have the first two routes of Chiang Mai. Sanpathong district Route No. 1013 to Amphoe Mae Wang. A place to Mae Will turn left , turn left. Then it traverses the path up the mountain for about 40 kilometers towards the end of this path is a -Din Street about 5 kilometers. Rainy require four wheel drive. The total distance of this route, 86 kilometers and takes about 1.5 hours from the start. From Chiang Mai to Chom Thong district before. Turn right on Highway 1009 to Doi Inthanon. Until kilometer 31, turn right on an asphalt road for about 17 kilometers to the Doi Khun Wang Royal Agricultural Research Center, a total distance of 115 kilometers and takes about 2 hours.